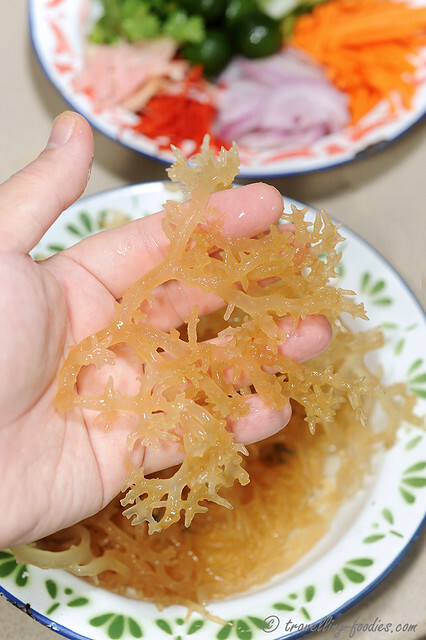 Kerabu Eucheuma Coral Seaweed is a very simple to prepare toss-in “wet salad” which is ideal as an appetiser. A melange of savory and sourish notes hinted with a bit of heat from the chilies make this moreish dish ideal to get those salivary glands working! Texture wise, it is also very interesting, a lovely blend of crunch from the julienned vegetables used as well as the “squishy” and “squirmish” qualities of the coral seaweed. A good dish is not complete without a thorough working on the aromatics. And this is well-taken care of by the use of bunga kantan as well as bombay onion, not forgetting the nutty aroma imbued through the generous sprinking of peanuts and toasted sesame seeds. Personally, what really made the dish work together is the belachan. Then again, that is almost entirely a personal bias. Dehydrated coral seaweed encrusted with a thin layer of salt. Stringy and slightly elastic like rubber band, they rapidly transform to what they are meant to be when they are back in their elements. Seaweed farming is commonly practiced in this part of the world, from the islands of Indonesia, past the Philippines, stretching all the way to the Okinawan Islands in southern Japan. 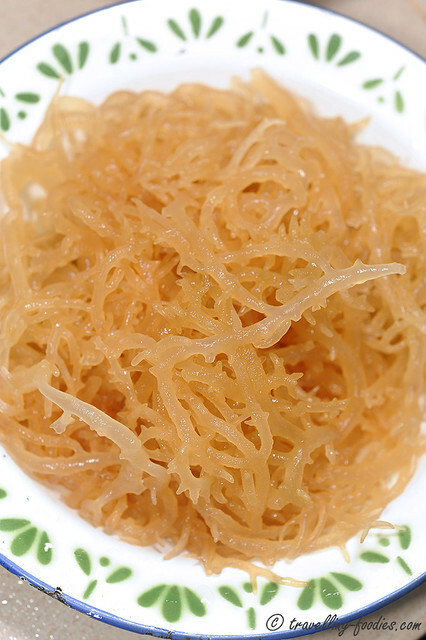 Seaweed culture is one of the trades engaged by the people of Tawau in Sabah. Reconstituted coral seaweed after some soaking and water changes, becoming much more voluminous many times over! Spreading open a “branch”, shedding light to their name, likening fan coral. The generic name represents a group of cultivated seaweed usually under the genera Eucheuma and Coralline. Rich in minerals as well as numerous trace elements, coral seaweed is often boasted to have skin rejuvenating properties amidst other medical qualities. 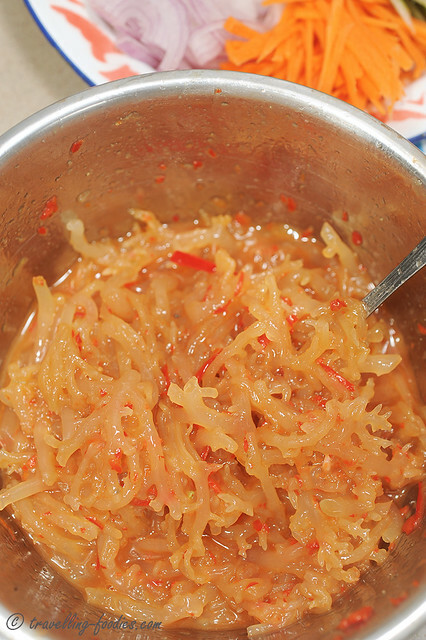 Pickling with salt and sugar, as well as a blend of chilies and belachan subsequently. It is good on its own already! 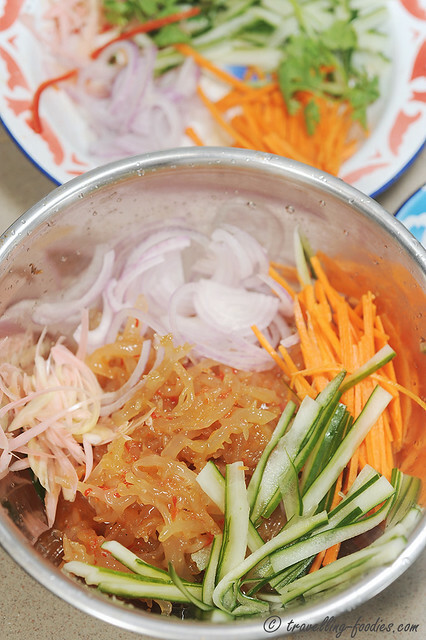 With the remaining ingredients in the mixing bowl a la bimbimbap before the final toss! 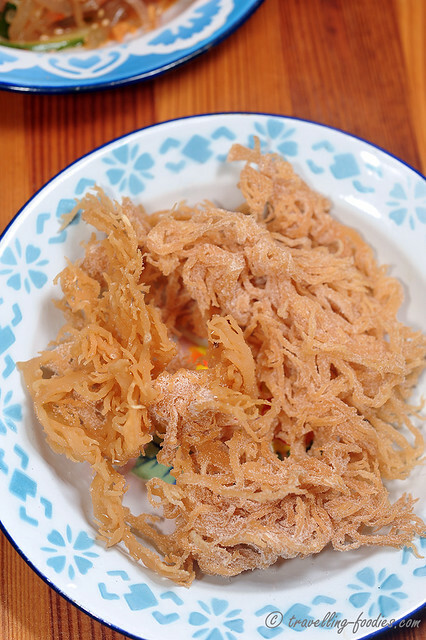 Reconstitute dehydrated coral seaweed in a bowl of water for 2 hours, changing water every half an hour. For the first 2 water changes, gently rub the seaweed between fingers to dislodge any bits of encrusted salt which fail to dissolve. Cut seaweed into smaller chunks with scissors. Drain well and set aside. Blend chopped chili, toasted belachan and lime juice under a coarse paste is obtained. Do not need to blend too finely. In a mixing bowl, add reconstituted seaweed, salt and sugar, belachan chili blend and mix evenly. Cover with clingfilm and refrigerate for at least 1/2 hour. After the pickling is done, taste and adjust with more salt, sugar and/or lime juice. 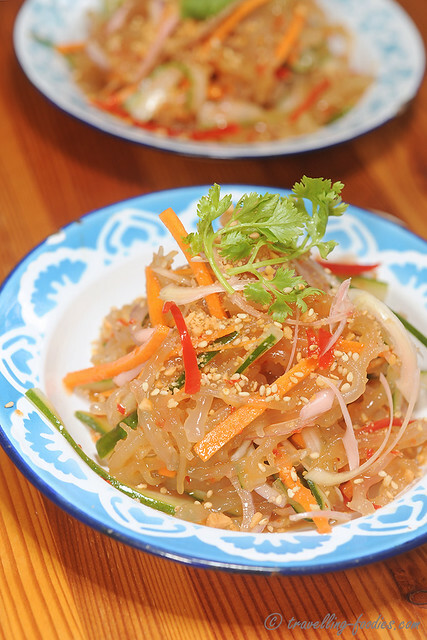 Plate up and sprinkle generously with sesame seeds and chopped peanuts. 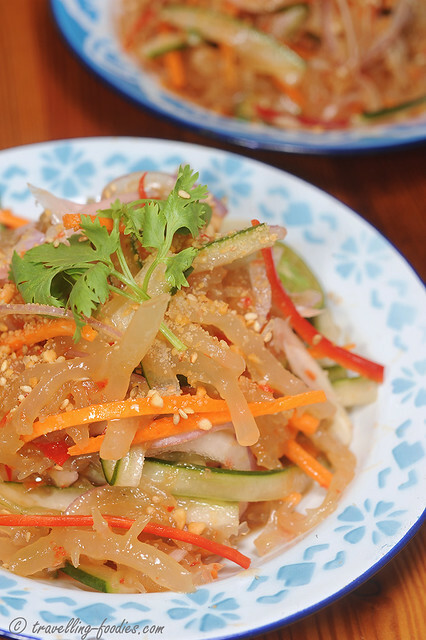 Garnish with chinese coriander if desire and serve immediately. This entry was posted on May 27, 2013 by Alan (travellingfoodies). 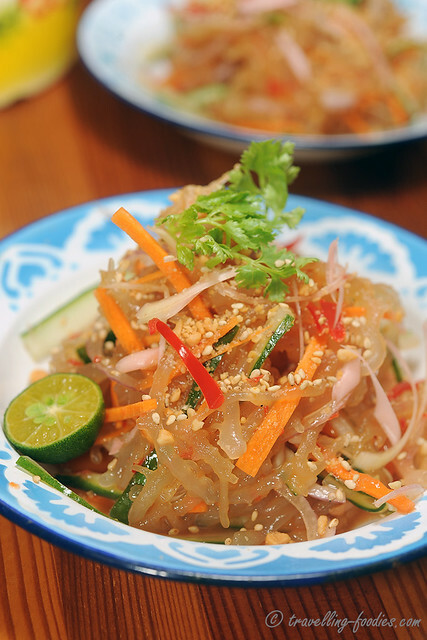 It was filed under Food, Simple Eats and was tagged with belachan, bombay onion, bunga kantan, calamansi lime, carrot, chili, coral seaweed, coriander, Eucheuma, japanese cucumber, Kerabu Seaweed, limau katsuri, malaysia food fest, MFF, Sabah, torch ginger. Hi Alan! This sure looks very appetizing! Do they sell the dried seaweed in supermarkets here? It”s making my mouth watering , Can i not put the belacan? Alan . yes you can omit it of course if it is not to your liking 🙂 Adjust the seasoning to your own preference. u can find lots of these in Semporna wet market Sabah, East Malaysia. all fresh! YUM. Very timely! Hubby just bought a big bag from Sabah. So far, I’ve only put them in dessert soups. can this be cooked hot?